Under major factions, we understand those factions that allow the player to join and offer complete questlines and player rank progression. These factions have scattered guildhalls across Cyrodiil. The Empire's military hand. Home defense in Cyrodiil, ensuring the peace of its citizens and suppressing unrest. Garrisons and patrols throughout the land. Divided in several sub-groups: The First Legion in Colovia, the Seventh Legion in southern Nibenay, and the Third Legion in the Imperial City. Also associated are the West Navy and the Battlemage Academy, also known as the Shadow Legion. The top ranks of the Legions are grouped in two militaristic knightly orders: the Knights of the Garland and the Knights of the Imperial Dragon. The Empire's state religion worships the Nine Divines, eight supreme spirits who sacrificed themselves in the creation of the world, joined by the spirit of Tiber Septim who founded the Third Empire. Omnipresent in Imperial affairs, but also considered a cold and formal faith by those that are not part of its priesthoods. Consists of the Nine Great Faiths of Akatosh, Arkay, Dibella, Julianos, Kynareth, Mara, Stendarr, Zenithar, and Tiber Imperator. There are also various charismatic sub-cults across Cyrodiil, dedicated to specific aspects of the Divines. Some of these are part of the Imperial Cult, some are not. The Emperor is the head of the cult, but it is governed by the Ennead, the council of nine Arch-Prelates, and by the Imperial Seminary. Large mercenary organization chartered by the Empire. Takes contracts from organizations and private citizens, provided they fall within the bounds of the law. The Guild halls of Nibenay call themselves the Syffim, and practice the ancient Akaviri philosophies on which the guild was originally founded. Foremost organization of magical scholarship in Cyrodiil. Dedicated to the study and application of magic, as well as the general education and betterment of the people. Both the Mages Guild and the associated Arcane Universityare governed by the Council of Mages. The guild is protected by the Order of the Lamp. Union of Cyrodiil's major and minor thieves. Illegal. In the Imperial Province, the Thieves Guild is an old and powerful faction, with its own distinct customs, rituals, and philosophies. Ruled by the Gray Fox, though many lesser gang leaders exist throughout the province. Blood nobility of Colovia, descendants of Nordic invaders. Sworn to their code of duty, chivalry, and piety. The Colo-Nords govern the west, and are well-connected in the Legion. Most official positions in Colovia are exclusive to people of Colo-Nordic descent, and they are the only ones allowed to take part in the Al-Shor Cult. Also known as the Battlemage aristocracy, these influential sorcerer-families govern the Nibenay. Their blood-ties to the Akaviri and inherited Ayleid secrets make them powerful mages, though not even they understand the exact workings of some of the magics they inherited. A nobility of merit: scribes, administrators, prefects, politicians and diplomats who keep the Empire running. The Census & Excise Office is connected to them, as are many other offices, councils, and authorities across Cyrodiil. Strong rivalry with the traditional nobility. Plagued by corruption. Murder-cult and assassins for hire. The Dark Brotherhood is illegal in Cyrodiil, but tolerated for their invaluable services to Heartlands politics. The Brotherhood is an offshoot of the Dunmeri Morag Tong, and worships Mephala. Their creed is to murder the world, though most cult members consider the religious aspect of the faction a distraction from its businesslike aspects. The Brotherhood operates under the guise of the Latent Iris Cult, a legal Nibenese Mephalite sect. Under minor factions, we understand those factions that allow the player to join, but only offer limited questlines or incomplete/conditional rank progression. Most of these factions are tied to a specific place in Cyrodiil. Ancient advisory body and governmental organization of the Empire. Only the wealthiest and most influential people in the Empire take a seat on the Council. The player can not join directly, but will receive a seat once they become the leader of a major faction. Elite order of spies, dedicated to protecting and serving the Emperor. Originated with the Akaviri Dragonguards of Reman. Most Blades operate as spies and covert agents, serving in the Emperor's information network. Bases in the hidden fortress-monastery of Cloud Ruler Temple. Blades "cells" can be found across Cyrodiil, investigating all kinds of things. The Blades also have a limited public face: agents and diplomats who work for the Emperor in an official capacity. However, this is a marginal aspect of their work. Blades agents also act as the secret bodyguards of the Emperor. The relation of this faction with the vanilla Blades is under review. Mercantile company chartered by the Empire. 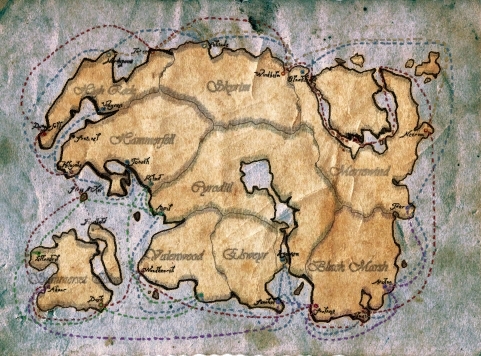 While it originated as a faction dedicated to exploiting Morrowind and Argonia, it has since spread out to form a near-monopoly on inter-provincial sea trade. Several lesser trade guilds compete with them on the local circuit. The EEC is a trans-provincial faction, and does not offer the option to join or progress in rank within Cyrodiil, However, the faction will acknowledge membership granted elsewhere, and may offer some quests. This scholarly organization does contractual work for the Empire's many maps and charts. Members are often attached to Legion expeditions to maintain and update sea and land maps. Currently working on a new Pocket Guide to the Empire. Associated with the Mages Guild. This scholarly organization mainly researches traces of previous Tamrielic civilizations. They are chartered by the Emperor to investigate Dwemer remnants in the east (and are infiltrated by the Blades for this reason). Within Cyrodiil, the Society is mainly interested in Ayleid ruins. The Imperial province's native vampire clan. Ousted all other clans from their territory. The original name of their clan is a secret. Unlike other strains of vampirism, the Order can easily pass for human, allowing them to infiltrate various organizations. A sizable cabal exists within the Curia. These factions are defined by their opposition to the Empire or to Imperial culture. They are usually local rebels, often associated with nearby provinces. Some may offer the player the option to join or aid their cause. Usually associated with a regional storyline, or with a Twin Lamps-style short and indirectly triggered questline. Political movement popular among the Nibenese upper class and native Elven minorities. Seek to revive ancient Ayleid morals and customs. Infiltrated by illegal Meridian worship. Popular political movement seeking the revival of the old Colovian kingdoms, either as semi-independent or wholly seceded from the east. The Free Estates operate from within the Colo-Nordic Lords faction, and act as both adversaries and allies in that questline. A new mercenary organization based in Lleyawiin. Local quest importance. Criminal organization and freedom fighters, Khajiiti guerrilla fighting against the Imperial occupation of the Molaquin Ren. Financed by the trade in Skooma and Moon Sugar. Native Argonian tribes of the Blackwood region, fighting against Imperial occupation of the trans-Niben. Deviant Nibenese culture-group. Isolated jungle settlements who follow the "old ways" of the tribal era. Most Deepwood Nibenese are the descendants of exiles who fled into the jungle. Considered backwards and dangerous by urban Imperials. Criminal Redguard organization, active in and around Sutch. Seeks to overthrow local Imperial rule and reunite the city with the province of Hammerfell. Supported by influential Redguard salt-merchants. The Antitemple, a secret fraternity of scholars and mages with roots in Marukhati theology. Originally a society of teachers and truth-seekers, their discoveries made them enemies of the Empire. "Flavor" factions are localized, mostly passive factions that do not offer the player option to join. Factions such as these do not even have to be defined in the CS, unless it is necessary to give them unique dialogue. Often, factions such as these will only occupy a few interior cells at most. Cousin to the Imperial Legion, the West Navy secures the western seaboard against hostile threats. Based in Anvil. Counterpart of the East Navy, based in the eastern provinces. Merchant company, trades in luxuries and goods across the Empire. Has an office in the Imperial City, but warehouses in several other locations. Unites Cyrodiil's wine producers. The Vintners are an important mercantile factions, with a stake in trade along the Gold Road. A major political force in Skingrad. Colovian wine from this area is internationally renowned. Ancient association of the Nibenese silk weaving schools. An influential mercantile faction: the Silk Weavers organize a form of primitive stock exchange using pieces of silk. Minor Imperial guild, of negligible importance. Authorized by the Guilds act. Most Imperial cities have one or two minor guildhalls for factions such as these. Compare to the guilds in Vivec City. Minor Imperial guild, of negligible importance. Authorized by the Guilds act. Associated with Dibella, active in the Imperial City. Minor Imperial guild, of negligible importance. Authorized by the Guilds act. Most Imperial cities have one or two minor guildhalls for factions such as these. Compare to the guilds in Vivec City. The Scribes Guild has a connection with the worship of Peryite. Listed separately due to their large number. Daedra worship is legal in the Empire, and Daedric Cults play a more prominent role here than in other provinces. Many operate out in the open, and offer certain valuable services to the population. Each offers small, contained quests to win the affection of their patron Daedra. Commercial sect with a monopoly on the worship of Clavicus. Also known as the Claviculaes or Mercantillists. Very popular and influential, especially in the merchant aristocracy. Clavicus is believed to have taught the early Nedes the concept of investment and interest, after Zenithar forbade them. Marketplaces in Cyrodiil are marked with the sign of the dog. Based in a market-temple in Delodiil. Espouse serenity through wealth. Worship of Peryite as the king of low order. Credited with teaching primeval men the number zero. Worshiped by lawyers, scribes, administrators, mathematicians, and architects. Also known as the Peryisii. They believe Peryite to be a mirror gestalt of Akatosh, with a dominion over the world in terms of abstract archetypes. Based in a temple in Quenti Turrai. Espouse insight by protocol. Dedicated to Sanguine, also known as Sang Du Rey, Prince of indulgence, ceremony, and vulgarity. Popular across Cyrodiil: the sign of the goat is used to identify inns, brothels, and gambling houses. Followers are also called the Sanguinistas. Housed in their infamous temple-baths in the Imperial City. Annually, they organize the Crendali Festivals, famed for their hedonism and excess. Worship of Vaernima, Prince of omen, dream, and fortune. Very popular in the Nibenay, where adherents control the trade in legal narcotics such as Sursum, Aegrotat and Quaesto Vil. Vaernimites ply their trade in floating apothecaries, sailing up and down the Niben. Based in their holy city of Nepenthe, at the edge of the jungle. Enigmatic cult of Boethiah, patron of policy, politics, and betrayal. The Boethites are integrated into every branch of the Imperial government, but their home base is in the old monastery temple near Culadiil, on the far eastern edge of the province. Influenced by Dunmeri philosophies. Ancient cult dedicated to Hermaeus Mora. Also known as the Hermaeotics. Hoarding knowledge is considered a sacrament unto itself. Known to ritually murder books. The cult is in a library-fortress in the northwestern Barrowlands. They espouse knowledge through sacrifice. Beggar-cult of Namira. Namitire ascetics pursue spiritual annihilation through mortification of the flesh and the spirit. They claim that the living world is a collective hallucination, subject to inevitable decay. Often accused of conspiring against the given order. Most Namirites are aimless beggar-monks and vagrants, though the most famous shrine of their order is a cavern in the Jerral Mountains where they pilgrimage to ritually freeze to death. New and upcoming charismatic cult, dedicated to Mehrunes Dagon. Dagon worship was once very popular in the Nibenay, but the old cults (such as the Quarter Palm or the Shattered Mirrors Cult) were all persecuted after the Simulacrum. Infamous sailor cult who worship Molag Bal as lord of the deep ocean, who must be placated with sacrifice. Maintain secret shrines in many port cities. Known for their ritual drownings. A cult dedicated to Nocturnal, popular among people working at night. Worship of Sheogorath, with a focus on self-annihalation through drugs, and a vested interest in the destruction of reputations. Large temple in the Imperial City, dedicated to the worship of the Community of Saints . Ancient moth-worship. Adherents are the only ones allowed to read the Elder Scrolls. Based in their monastery to the north-east, and in the great library in White-Gold Tower. Revered by Imperials. Small temple in the Imperial City, dedicated to the Dragonfires and the monotheistic worship of the One. They are the last legal Marukhati cult in the Empire. Extremist military crusader cult dedicated to Tiber Septim. Based in several "Blood Dome Temples", founded wherever Tiber Septim is thought to have shed blood on Cyrodiilic soil. Exclusive adherent of warrior-philosophies espoused by Reman. Memorial cult of Cuhlecain, pre-Emperor of the Septim dynasty. Rather cold and sober faith. Government-sponsored. Traditional hero-cult of the godPelinal Whitestrake. Its outdated views and rabid anti-Elven propaganda have made it unpopular in the Heartlands. Based in their monastery in Pell's Gate. Worship of Shezarr, the Divine spirit of man. A very outdated cult, only popular among small jungle communities. Both the Reman and Septim dynasties have made efforts to replace Shezarr worship with their own sponsored cults. Semi-legal soldier's cult, dedicated to the memory of Emperor Tiber Septim. Seeks to overthrow the current Emperor, whom they consider weak. Popular and heterogeneous set of worship practices, mostly associated with Colovia. Worship of the mortal heroes, prophets and oracles as exemplars of Divine Will and Law, who ascended to Aetherius. Commonly worshiped at roadside wayshrines, or in the exclusive Saintly Circles of Colovia. Influential religious and political factions of the Nibenese. Each society is considered representative of a certain social class or occupation. These include the Society of Bulls, of Moths, of Snakes, of Tigers, etc. Large and varied group of minor convents, monasteries, and orders, who worship splinter facets of the Divines. Last edited by Infragris on Thu Mar 12, 2015 8:57 pm, edited 3 times in total. This is a really great overview. The overall confict between administrative and inherited nobility, the mixmax of countless small, ultimately unmanagable cults, companies and minor factions. It all works so well with each other and creates an interesting overall picture. You're putting so much work into this all, it would be a shame if we couldn't explore at least some of this. The same goes for your books, but those only require us to include and put them into our existing gameworld. This faction layout is something we should definitely keep looking at for city-, dialogue- and quest creation. Well done infragris, this is essential information for telling the story we want to tell with Cyrodiil. I like the free estates thingy. Young Titus Mede should certainly appear as one of those nobles. I hadn't seen that before. Very awesome, will definitely be included. The Templars can still be the knightly order of the Temple of Talos in Bruma, but they also show up near their "Blood Dome Temples", founded on places where the blood of Talos was spilled during his conquests. We should have one of these close to Sutch. Militant psychotics, munching on ebony steroids. I love it. The Imperial Administration has been changed to the Curia. This is an old word to denote councils or gatherings, and is still used today for the hierarchical government of the Catholic church. It sounds reasonably unique and fits the nature of this political/administrative faction better. Likewise, the Noble Battlemage of Nibenay are known as the Hierophants or Hieratic clans. This avoids confusion with the player class and the purely military battlemages of the Legion. I like both changes, though I would propose to keep the word Imperial, so it would be "The Imperial Curia" to avoid any sort of unnecessary confusion. I also have an idea/proposal regarding Mages Guild questline. Maybe there is already a plan for it? I deliberately dropped the "Imperial" to evoke the idea of the Temple in Morrowind - technically the Tribunal Temple, but because it's such a monolithic thing nobody ever feel the need to specify. I could change it if it's confusing. There was some Mages Guild discussion on the old forums, bur nothing specific came out of that apart from a focus on the outlawing of necromancy. I'd be interested to hear your proposal. Once again, what are our playable factions? What am I missing if anything? I think we could focus some more on the quest lines, so we can build the world with future quests in mind. It would be much more strategic approach than first building the world and then deciding on the quests. At least, I believe so. Maybe I am missing something from the existing plans. There was a suggestion at some point the Kali Mes would be a joinable faction related solely to the main quest in Sutch (whether it should be part of Hammerfell or Cyrodiil). It would be more akin to the EEC in Bloodmoon, as in very focussed on a single plot-line in a single location with very few miscellaneous quests that don't advance that plot. I'm actually not sure if the EEC should be joinable? They have a presence in Cyrodiil, but all of their activities happen in other provinces. If anything, they should just acknowledge your membership from Bloodmoon. Infragris wrote: I'm actually not sure if the EEC should be joinable? They have a presence in Cyrodiil, but all of their activities happen in other provinces. If anything, they should just acknowledge your membership from Bloodmoon. I'd agree, though you'd certainly see their offices and warehouses along the Niben, Imperial City, Topal Bay, and Anvil. Considering they don't pose the problems here that they do in regions like Vvardenfell, I can't imagine there's too much we'd be able to do with them , aside from involvement in some side-quests, such as a tale of stowaways from another province. The Red Nobility - interesting idea, but maybe we can have three different factions instead? In the vein of original Morrowind Great Houses, that would actually totally make sense. One faction the Free Estates, a faction of Colovian warrior nobles. Another, a faction of Nibenese mystic nobles. Third, cosmopolitan nobility of Imperial city. You can pledge allegiance to only one, because all three have contradicting interests and will not accept someone with a pledge to another group. I am probably copying original game too much and we can probably be more creative. Though, from gameplay perspective it makes total sense to have Colovian as "warriors", Nibenese as "mages" and Cosmopolitan Imperials as "thiefs". Maybe we can can use that differentiation somehow. The Imperial Curia (which I will keep referring to as such, because it sounds more official) can probably be incorporated as part of the main quest, unless you have some specific plans in mind already. Although, it could probably be joinable, but I am not sure how exactly it's going to work. You are not going to be a clerk and becoming the head of it is impossible, so it's kinda tough to make it a full quest line, but maybe possible. The Elder Council - once again is probably best left for the Main Quest, but it would be interesting to see how your influence can grow through advancing in various factions and guilds. Some of the guilds or other organizations (Silk Weavers Guild etc.) - don't see a point in a full quest line, seem more like a couple of quests at best. The Daedric Cults - same here. These don't need to be full-fledged quest lines, one or two is enough, but maybe one can be an exception. Still not sure how best to handle them. They should also come up in the Main Quest and Guild Quests. The Totemic Societies and some other minor cults - provide one-time or a couple of quests, maybe short storylines. Don't see them as joinable factions. What I completely forgot are the Knight's Orders! At least some of them should be joinable, that's for sure. I think there's merit in imitating the Great Houses approach to political intrigue. I would keep the Free Estates separate from the classic Colo-Nords: they're separatist extremists, and most Colovian nobles would probably want to remain in the Empire. I see the relation between these two groups as something like House Hlaalu and the Camonna Tong. The idea of Heartlands nobility came up before, but they don't really have a defined identity like the others do, and the Imperial City is supposed to be a battleground between the Colovian and Nibenese factions, not an independent powerbase. Here's a concept: what if the (Imperial) Curia takes their place as the "nobility of merit". In practice, they already have the identical function: both the Curia and the nobility control territory as rulers. This would turn it into a three-way political battle between Colovian martial conservatives, Nibenese mystic clans, and Heartlands administrators - mirroring the warrior-mage-thief system. EDIT: there's some talk on the knightly orders here. The only thing we would need to do is to somehow represent them properly, so they feel like three opposing powers. That would be quite difficult to achieve, since they are more diverse and spread than the Great Houses, but with proper use of symbols, style and representation, as well as through the quest themselves, we should be able to achieve it. I have had some thoughts about what we need for each faction to establish properly and I came up with this system. I believe in systematic approach, at least while planning. We can change some of the details in the process and everyone will be able to contribute, where details on which we all more or less agree will be added. If you feel that anything is missing in my categories, feel free to add. 1) Name - that's pretty self-explanatory, but name must represent the faction properly, be interesting, and most factions can have several names. 3) History - how it was formed, by whom and when? What happened to it since then? 4) Ideology - why does it exists, what unites these people? Can be material gain, spiritual growth, self-defence, cultural identity, political agenda, etc. 5) Power Sources - where does it get the power? It could have influential patrons, faithful believers, economical prowess, magical knowledge, etc. 6) Goals - what are the goals of the faction, what does it try to achieve? It can be trying to preserve current order or to somehow change things, but how? 7) Struggle - each faction has enemies, inside and outside. What is its struggle, what are the challenges? It would be very important in quests. 8) Symbols - combining all the knowledge about the faction together, how can we represent it properly? It includes general style, its images, signs, banners, clothes, all sorts of tools and items. Factions can have subdivisions on groups, where while general idea stays the same, it will have different views on certain things. Sub-groups should have similar structure of description, though they don't need as many details as the main faction. In the example of Ashlanders, different tribes are sub-groups. Hope we can restructure our factions and I hope it helps. It should help us to understand where exactly we want to go and what element of the faction is under-developed, so we can focus on it. P.S. Added another point to the hierarchy - History. The Daedric Cults don't necessarily need to be fleshed-out factions, but there does need to be a disposition factor involved here. If you're the chosen mortal of Molag Bal, then Boethiah and Meridia's cultists should attack you on sight, and vice versa. If you're Azura's chosen mortal, then Boethiah and Mephala's cultists should like you more, and vice versa. But many of these Daedric cults despise each other, so they should not get along; you shouldn't get to be the chosen mortal of every Daedra, since they generally don't like each other. Nobody's getting attacked on sight without good reason. These aren't hobos living in the wilderness like in Morrowind: Daedra worship is legal in Cyrodiil, and most of the cults have perfectly respectable positions in society. Many even offer valuable services or fill economical niches. Cyrodiil also has a long tradition of religious tolerance, so cults don't just hate each other without good cause - and even if they do, they'd need a solid casus belli before declaring temple war. Anyway, this list of the Daedric cults is out of date: please check here for more information. I think it would be cool to have a chantry in each town, each corresponding to one of the Nine Divines. They had them in Daggerfall, and they could be apart of the Imperial Cult. For example: you could go to Bruma and find the Chantry of Akatosh and do quests relating to Akatosh. Of course not all quests would be towards Akatosh, some would be generic Imperial Cult quests, but I think it would be cool to have a questline for just Akatosh and the other Nine Divines. Naturally, I may be late, but its something that I felt was missing in Oblivion and I think it would be really cool to see. Yes, that's what we're already doing. Seriously, I had no idea. That makes me really happy in all honestly. How far are you guys with those quests and do you need quest ideas? I don't know how much I could help, but I'd love to. Quests for the Imperial Cult will be organized around nine quest hubs corresponding to each of the "Great Faiths", ranging from low-level tasks for the general Imperial Cult faction to high-level spiritual journeys for each of the Divines. In our vision of Cyrodiil, the Imperial Cult is less uniform and united than the missionary branch we see in Morrowind, and each of the Faiths has their own internal culture and traditions. For more information, you can check out this and this article. I'm afraid we're not really in need of quest ideas at the moment, since storylines for the major factions can sadly only be implemented once a suitably large area of land has been developed. Our current priorities are asset development, regional concepts, exterior and interior making. of course, any help is more than welcome: if you want to join the project, you can submit a showcase here. Thanks for the links, man. I like the idea that the Imperial Cult is less organized in Cyrodiil. It makes it feel less alienated like it does in Morrowind, and that makes sense since it is the homeland of the Imperials. The Temple Zero Society and the Emperor Zero Cult are too similar in name for my liking. Also, what happened to the Ratcatchers Guild? I forgot about the ratcatchers. Likeness between T0 and Emp Zed is out of our hands, both are lore factions whose name I am not inclined to change. If it helps, they will serve completely different roles.